You’re used to seeing YouTuber Kurtis Baute -- self-proclaimed whimsical scientist -- boxed into the 16x9 frame of a JW video-player. But on Wednesday at midnight, he’s caging himself into something different: an entirely air-tight, 1,000 cubic foot greenhouse. “I’m sealing myself in a glass jar,” he explains in his latest video. The greenhouse does, however, serve a very good purpose: Baute predicts that it will demonstrate some of the immediate effects of climate change. The Vancouver-based YouTuber plans to remain within the confines of his 10-foot-cubed “jar,” which is lined with approximately 200 plants (including Sir Stabbington, the cactus), until he can no longer breathe. “It’s kind of a microcosm, it’s the tiniest of examples of what we’re doing to the earth,” he explains. He wants to know how long he can last, relying exclusively on plants for oxygen. “It’s going to get really hot in there,” he muses. As it turns out, Baute’s experiment is not the first of our time. In the 1700s, a scientist placed two mice into separate glass jars -- one with plants, and one without. The plant-free mouse died quickly for lack of oxygen, while the other survived. Baute, who will have paramedics on-hand closely checking his vital signs as CO2 levels rise in his mini biome, will not die -- but he will do his best to convey the disastrous effects of increased carbon emissions on our air quality. 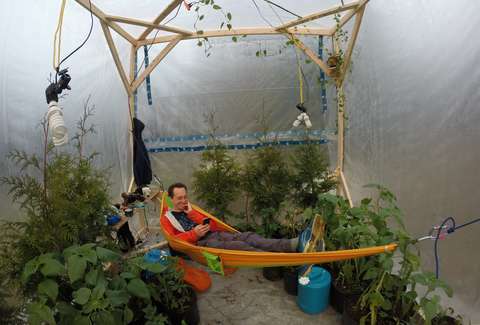 While he remains trapped within the pseudo greenhouse, Baute will continue to produce YouTube videos offering helpful lessons on climate change and environmental awareness. “I think issues like climate change will only change if enough people get on board with it and make fundamental changes to their lifestyles,” he explains, somewhat heroically. He plans to last three days in his glass jar in the good name of science -- and probably more YouTube subscribers.